Three of the candidates for Minneapolis mayor are debating crime-fighting tactics and public safety issues at a forum Wednesday night in Minneapolis. There's a reason public safety is a big issue in the campaign for mayor of Minneapolis: the city has seen an increase in violent crime recently. The murder rate as of last month is 55 percent higher than a year ago. Minneapolis, Minn. — Violent crime is rising in the city of Minneapolis, and mayoral candidate Peter McLaughlin is reminding voters of that every chance he gets. 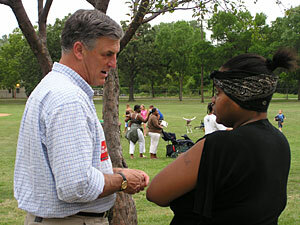 McLaughlin was busy stumping for votes recently at an ice cream social in Webber Park on the city's north side. While the kids are busy playing in the park, parents sit at seven makeshift tables. McLaughlin is shaking hands with grown-ups and talking about public safety. Some of the people here tell him they won't let their kids play in the park by themselves because they're nervous about crime. Five Minneapolis children have been hit by stray bullets in the past two months. Nicole Simpson sits at one table with her mom and her sister. She seems receptive to McLaughlin's pitch to hire more cops and increase community involvement. "If the bad guys know that there's people in the community that aren't going to stand for it, that's half the battle right there," Simpson says. "Right," McLaughlin responds, "and we did a lot of that organizing on the south side when we had crime troubles before. But if you don't have that relationship with the community and the sufficient number of police, you can't do it." McLaughlin says that group effort has suffered during R.T. Rybak's first term. He says Rybak's previous budgets cut police officers, which he says contributed to higher crime in the city. McLaughlin characterizes it as "letting the crime genie out of the bottle." "He's been trying to paper over the problem and underfund the police department for his whole time in office and he's now paying the price but worse yet, the people of Minneapolis, are paying the price," he says. McLaughlin says Rybak should have taken a police pension fund deal that was proposed in the Legislature in 2004. He says the proposal would have freed up money to put more cops on the street. He also says Rybak only started focusing on public safety to protect himself politically. Rybak says the criticism is unfair. "It's frankly an insult for Commissioner McLaughlin to say that I haven't been involved in public safety. I have been there every step of the way," Rybak says. Rybak provides the example of the city working with Hennepin County and private security groups to successfully decrease crime in downtown Minneapolis. More importantly, Rybak says his current budget proposal adds another 70 police officers to the force. He said he's been operating under real world budget constraints while McLaughlin will never be able to pay for all of the campaign promises he's made. "Commissioner McLaughlin seems to want to run as the boy in the bubble ignoring the fact that I took over the reigns of the city when there was huge debt built up, when the state made huge cuts and I was the one who had to make it work and we have. What's important about that is public safety has been the number-one priority of every budget I delivered," Rybak says. This isn't the first time crime has been an issue in Minneapolis. The city was dubbed "Murderapolis" in 1995 when there were about 100 murders that year. Police say so far this year there have been 39 homicides in the city. While McLaughlin and Rybak continue to debate which candidate is doing more to fight crime, Green Party candidate Farheen Hakeem says there are more important issues facing the city. "We need to do something about the job situation," she says. "To me that's a much more higher priority than public safety." Hakeem says it's more important to increase the quality of the city's police force than the number of police officers. She says more diversity training would help ease the concerns that people of color have when a police officer pulls them over or walks up to their door. Hakeem says she's also disappointed that McLaughlin and Rybak are focusing so much time and effort on the public safety issue. "I feel that Peter McLaughlin is cultivating the culture of fear. Make people scared and make people so scared that they'll vote for me and that's that. I felt disappointed that R.T. Rybak folded in on that," she says. But McLaughlin says he'd prefer not to be talking about crime but events in the city have made it a top concern among voters. All of the candidates for mayor will continue to campaign for votes up until the primary on September 13. The top two vote-getters in the non-partisan primary will then move on to the November general election.